Family-friendly places like Ramoji Film City and Ashtalakshmi Temple will thrill your kids. 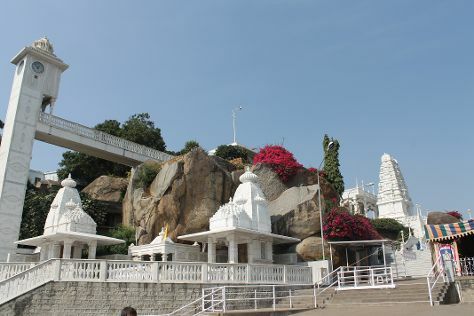 Explore Hyderabad's surroundings by going to Secunderabad (Guruvayurappan Temple - Mceme - Secunderabad, Katta Maisamma Temple, & more), Chinna Jeeyar Swami Ashram (in Venkannaguda) and Sri Vidya Saraswathi Shani Temple (in Warangal). Pack the 5th (Mon) with family-friendly diversions at Wonderla Amusement Park. Plan for a day of cool, family-friendly fun on the 9th (Fri) at Srinidhi Joy N Joy Resorts. There's still lots to do: examine the collection at Salar Jung Museum, let your taste buds guide you at a local gastronomic tour, make a trip to Sri Ramakrishna Math, and take in the spiritual surroundings of Birla Mandir. To see more things to do, where to stay, reviews, and other tourist information, use the Hyderabad trip itinerary builder app . New York City, USA to Hyderabad is an approximately 19.5-hour flight. You can also do a combination of train and flight. The time zone difference when traveling from New York City to Hyderabad is 10 hours. In August, daytime highs in Hyderabad are 88°F, while nighttime lows are 73°F. Finish your sightseeing early on the 29th (Thu) to allow enough time to travel to New York City. Family-friendly places like Central Park and The Metropolitan Museum of Art will thrill your kids. Explore New York City's surroundings by going to Bronx (Yankee Stadium & Bronx Zoo). There's lots more to do: admire the striking features of Empire State Building, pause for some photo ops at 9/11 Memorial, don't miss a visit to Times Square, and steep yourself in history at Ellis Island. To see reviews, ratings, more things to do, and other tourist information, go to the New York City trip itinerary planner . Traveling by flight from Hyderabad to New York City takes 19.5 hours. Alternatively, you can do a combination of flight and train. The time zone difference moving from India Standard Time to Eastern Standard Time is minus 10 hours. Expect a daytime high around 84°F in August, and nighttime lows around 71°F. Wrap up your sightseeing on the 26th (Thu) to allow time to travel back home.